As a digital marketer, I know how important it is to have seasonal appropriate content. Since today is #Christmas for majority of the Western world, writing about food related to Christmas seems like the right thing to do. But I don’t usually do the right thing, I like confrontations and bucking against the trend. So the post below is a dinning experience from November 30th. This is the second time I was at Fig & Olive. 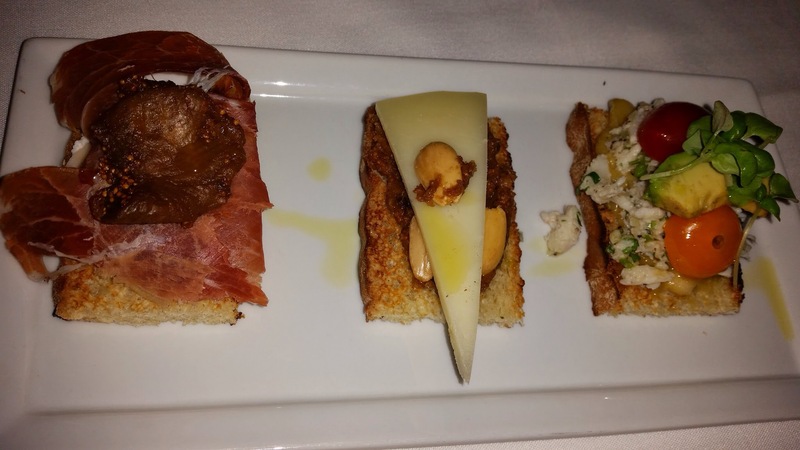 The last visit was a Hudson Valley Restaurant Week visit. Click here to read the last review. This time I brought a new friend with me to sample other dishes. When we arrived, we were able to choose our seats. We chose to sit at a corner next to each other vs. across the table from each other. The host commented that we must like each other. It struck a chord with me. Why would anyone have dinner with someone they don’t like? Life is way too short to write about Christmas if you don’t celebrate Christmas. Life is also way too short to go to dinner on a Sunday night with someone you don’t want to sit next to. Like a good digital marketer, I use a friend #ConversionFunnel and only have dinner with friends who have the potential to move down the funnel. Crab, Heirloom Tomato, Avocado, Apple Aioli. I cheated. I really liked number 3 last time so I repeated here. All of them were very good. Enjoyed them thoroughly. 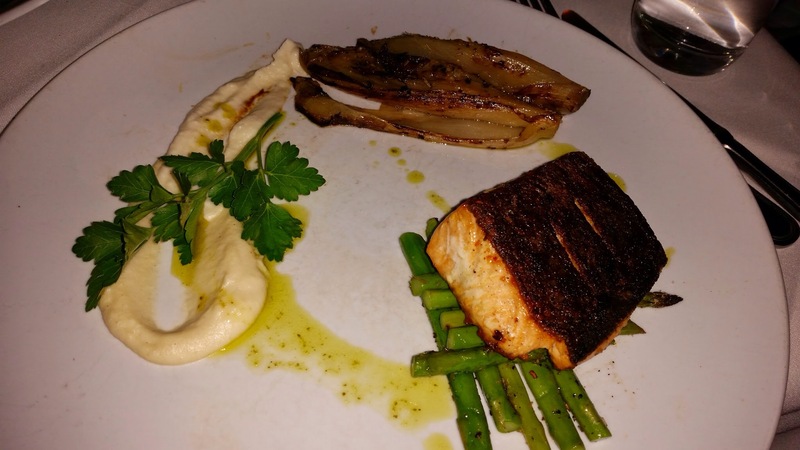 This is the RIVIERA ORGANIC SALMON: Seared organic salmon, grilled asparagus, braised endive, cauliflower purée, basil infused olive oil. Honestly, I was leaning toward ordering TRUFFLE RISOTTO: Arborio rice, cremini and black trumpet mushroom parmesan, scallion, parsley, with White Truffle Olive Oil. I opened my mouth and asked my foodie friend to help me decide on one. He told me that “the white truffle olive oil tastes like cancer.” That pretty much killed any desire I had for the Truffle Risotto. The Power of Words. As far as the salmon, it was fine. Grilled just right, not too dry nor too pink for me. The cauliflower puree was a nice companion to the salmon. But my favorite was the grilled asparagus. Should have ordered it as a side dish! 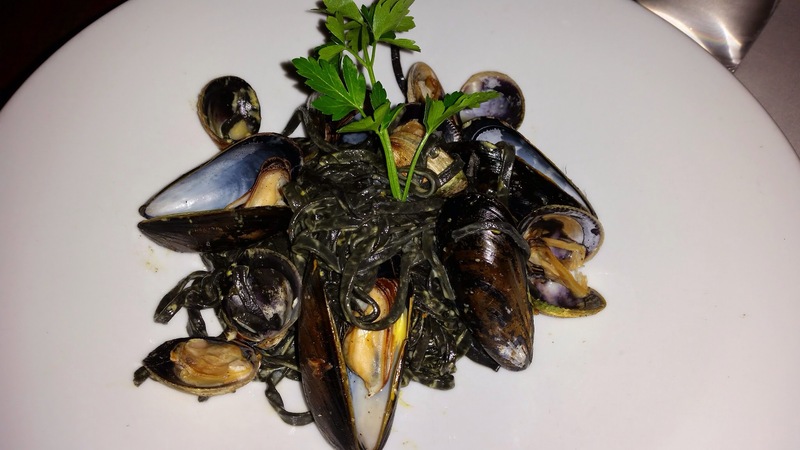 SQUID INK TAGLIATELLE: Seafood tagliatelle, mussel and clam, saffron broth. Unfortunately, this dish did not deliver the punch. It was bland. How disappointing was this? Looked great but tasted not so great. Later on in December, I had a third experience at Fig & Olive and ordered FIG & OLIVE CHICKEN TAJINE: Moroccan spiced chicken served with fig, olive, apricot, carrot, zucchini, cipollini onion, tomato, toasted almond, couscous with cilantro and harissa – Hojiblanca Olive Oil. 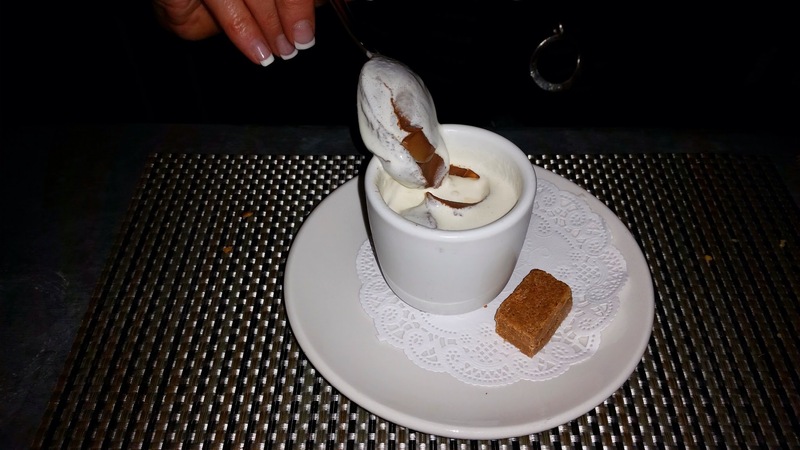 I had eaten the Chicken Tajine in my last Fig & Olive post and was very smitten. I am a sucker for the Moroccan cuisine so I went back for the same dish. The December experience was so bad that I won’t write about it. The center of the chicken thigh was slightly colder than the room temperature. The chicken tasted like it was just thrown together at the last-minute. Yuck! The inconsistency of the dish! I could only rationalize it by thinking that since my last visit was on a Monday, the regular chef must have the day off. But really, is that a reason? My friend and I wanted to take advantage of the Hudson Valley Restaurant Week, Nov 3-16 2014, to go outside of our monthly routine. 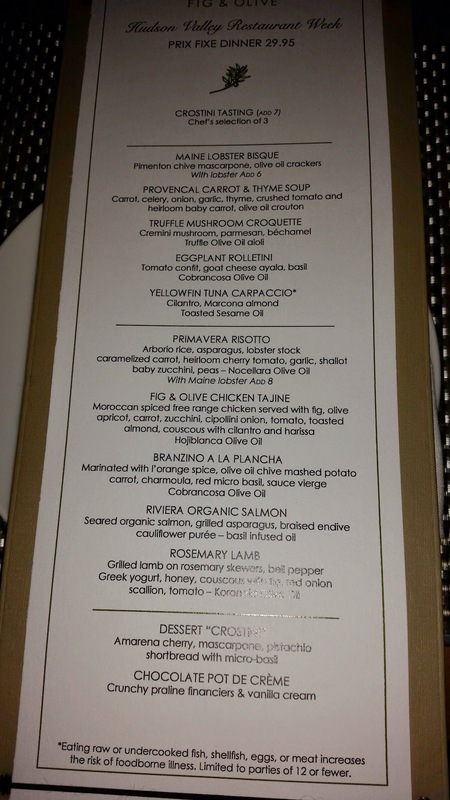 I picked Fig & Olive, a Mediterranean restaurant, in Scarsdale because it was easy to make a reservation through OpenTable and their special Hudson Valley Restaurant Week menu was on hudsonvalleyrestaurantweek.com. All clicking from the same page. To all Digital Marketers, create an easy user experience and the business will come! 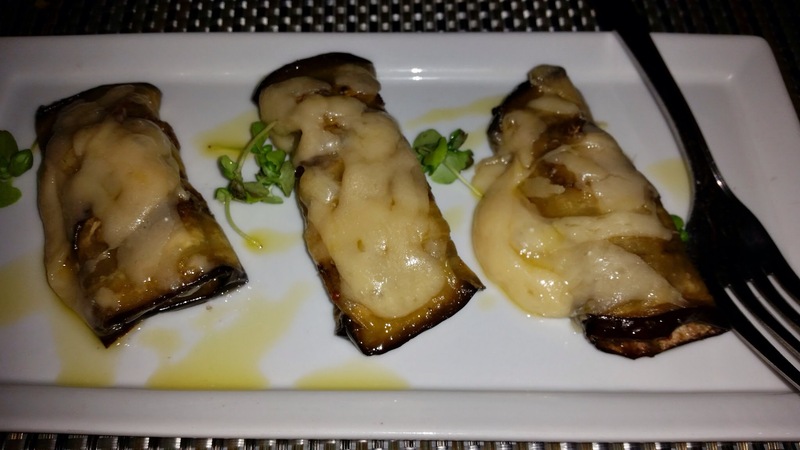 EGGPLANT ROLLETINI: Tomato confit, goat cheese ayala, basil, and Cobrancosa Olive Oil. This was excellent. Very cheezy and probably not great for the arteries but it was delicious. 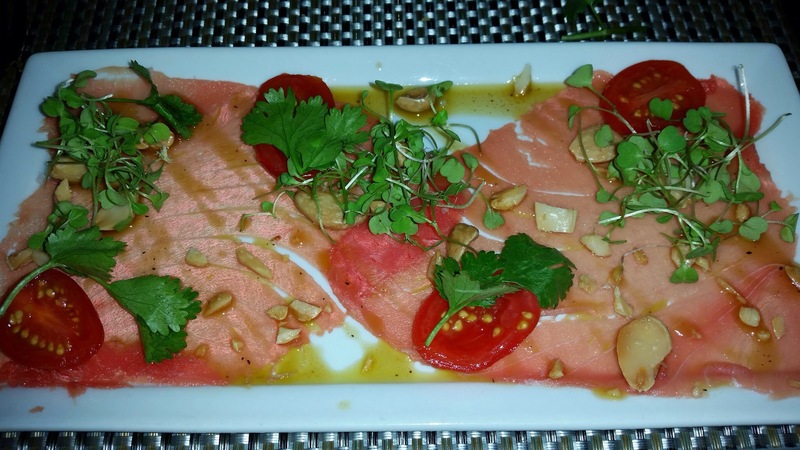 YELLOWFIN TUNA: Cilantro, Marcona almond and Toasted Sesame Oil. This was also excellent, light and airy, leaving me wishing for more. 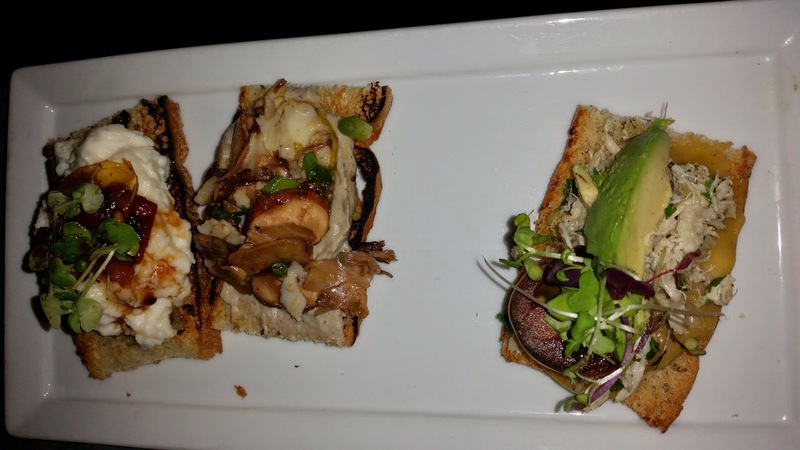 CROSTINI– from left to right: Burrata, Tomato, Pesto, Balsamic; Mushroom, Artichoke, Truffle, Scallion, Parmesan; Crab, Heirloom Tomato, Avocado, Apple Aioli. All excellent. So good that we almost did not want to share with each other. 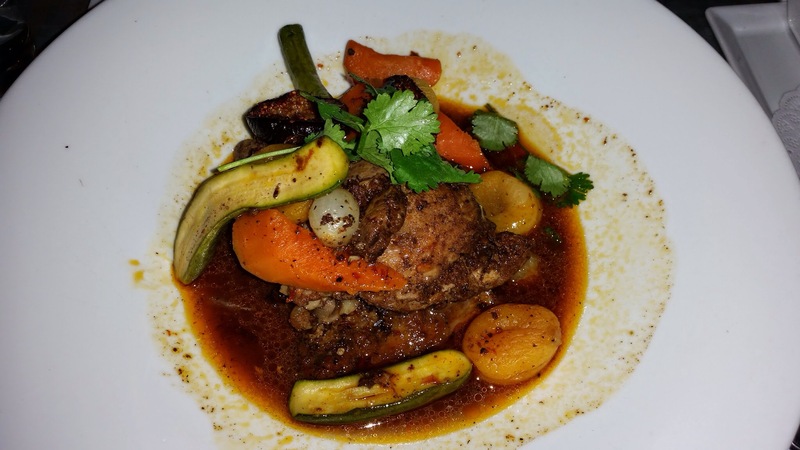 FIG & OLIVE CHICKEN TAJINE: Moroccan spiced free range chicken served with fig, olive, apricot, carrot, zucchini, cipollini onion, tomato, and toasted almond. This dish had many layers. I thoroughly enjoyed every ingredient. Especially loved the apricot, fig, and olives. The Moroccan spice was just right, just spicy enough but not over powering. In reality, I tried this dish twice. The first time here was fantastic and the second was dismal. In the second round, the center of the chicken thigh was not hot and sightly cold to the touch. Consistency is obviously not their forte. Couscous with cilantro and harissa, Hojiblanca Olive Oil. 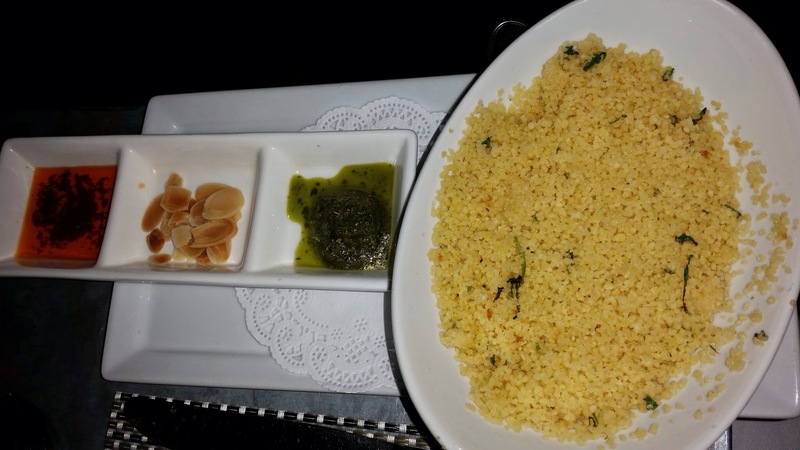 The garnish on the couscous kept me eating. The mixture of each with the couscous and the combination of them all were quite a delight. 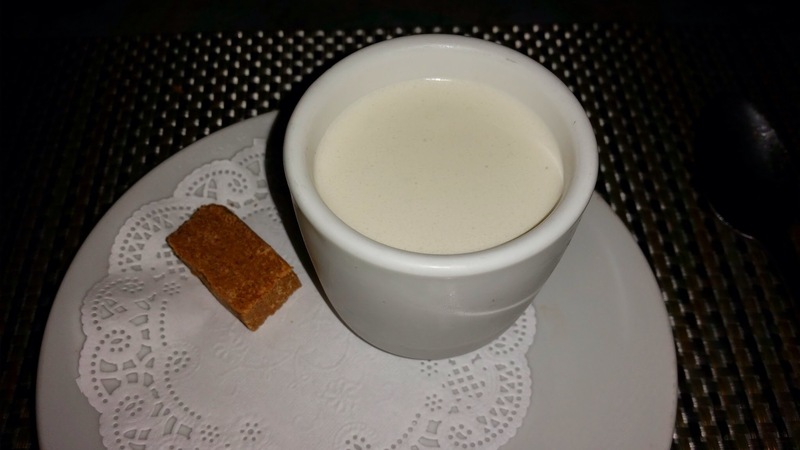 CHOCOLATE POT DE CRÈME: Crunchy praline financiers & vanilla cream. I love this dessert. Very very good. Worth a second and a third time. This is the chocolate pot de creme in action, getting mixed to create that sweet and tasty sensation. This was a very happy outing. Both my friend and I walked away satisfied and fed well. Will definitely be back. Recommend for all!